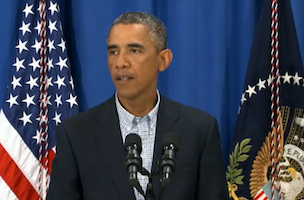 President Obama addressed the arrests of two reporters in Ferguson, Mo. Wednesday night at a press conference he offered Thursday afternoon in Martha’s Vineyard. “Here in the United States of America, police should not be bullying or arresting journalists who are just trying to do their jobs and report to the American people on what they see on the ground,” Obama said. The Washington Post’s Wesley Lowery and HuffPost’s Ryan Reilly were arrested, assaulted and released without charges, paperwork or the names of the arresting officers amid protests in the Missouri town after an unarmed African American teen – Michael Brown – was shot and killed by police on Saturday.